Our Chroma Tube just got an upgrade… Introducing the brand new Chroma+ Tube. This brand new tube is the latest addition to our range of sensory equipment and is going to create even more engaging sensory experiences. We hope that you will enjoy the new Chroma+ and can see the benefits of adding it to your sensory room. Please read on to find out a bit more about the new tube and also see a video of it in action at the bottom of this page. The Chroma+ is an upgraded version of the ever so popular Chroma Tube. It has 13 different modes and various colours that will engage users in sensory rooms and immersive spaces. Using our in-house technical know how we wanted to create something that was more than just a column of light, the Chroma+ provides a spectacular lighting experience and is one of our most interactive pieces of equipment. Simply plug in and play with the Chroma+ straight out of the box. It will look great in any area of your room and provides a calming glow to the lights. It uses special LEDs to provide the lighting effects of all the various modes. You can control the Chroma+ using the sensory remote controller. The controller has five buttons and also 3.5mm ports for plugging in assistive switches to control each button. The white button in the middle changes the mode of the Chroma+ and the 4 colour buttons (red, blue, green and yellow) will change the colour. You can also colour mix for 4 extra colours. The Chroma+ will go into a passive mode when not used with a controller allowing the user to enjoy the lighting effects in a calming and relaxing way. How to use the Chroma+ in a sensory room? 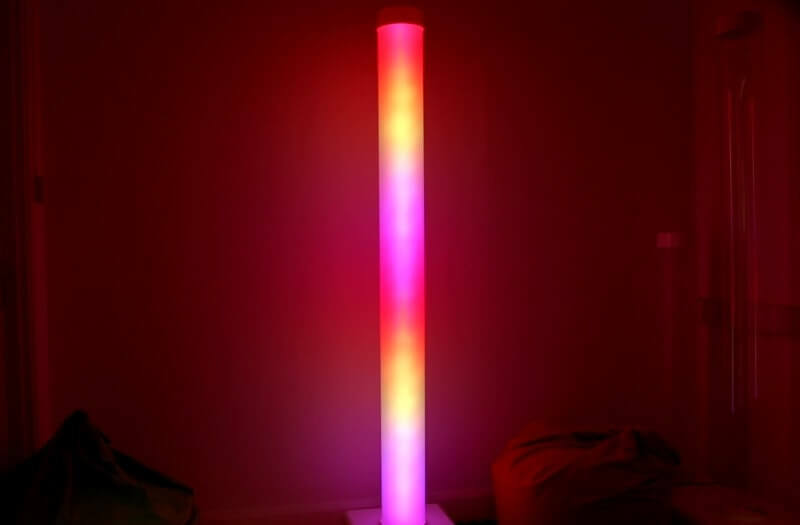 You can use the Chroma+ tube in a variety of ways in a sensory room or immersive space. We find that using the Chroma+ as an interactive learning tool to be a great option for teachers as the user can enjoy learning and play at the same time. 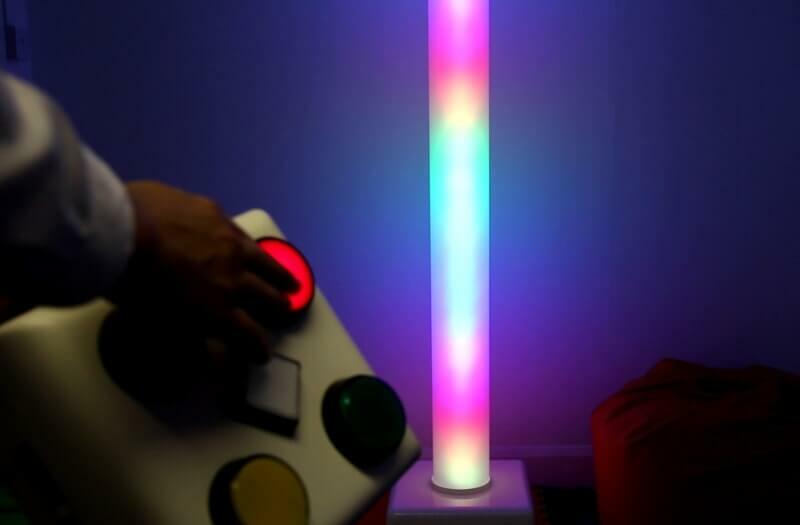 Using the sensory room controller you can teach the principles of cause and effect, the user can also develop their visual tracking skills as modes on the Chroma+ include specific lights that bounce up and down, ideal for tracking. 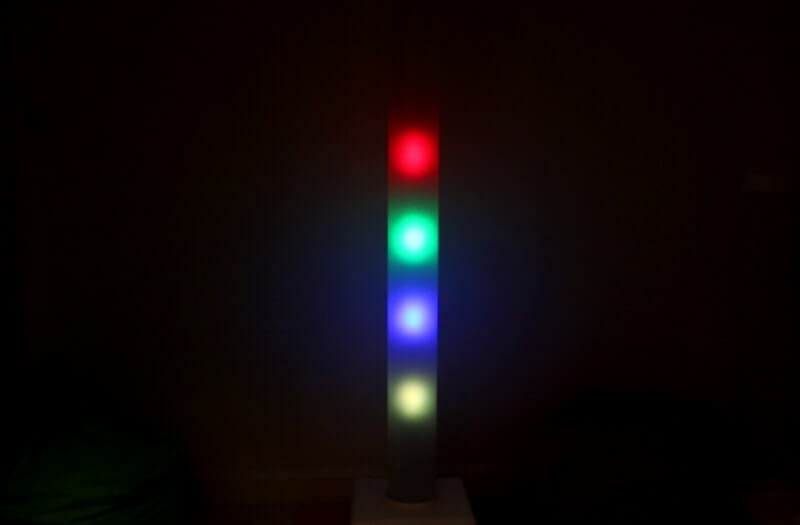 You can use the Chroma+ has a relaxing feature in your sensory room. The warm glow of the lights provides a calming experience. Check out the video below for a detailed look at the different modes of the Chroma+ and get in touch to discuss talk about pricing and how we can help with your sensory room experiences.